We went to IKEA this past weekend to find some organizing solutions for a couple of our closets. We also wanted to replace some floor lamps that either broke during our move a couple of years ago or were damaged by the kids. This is exactly why we like to purchase floor lamp replacements at IKEA for $10. We won’t cry too much when they get knocked over. Again. A trip to IKEA always is an interesting experience. We usually drop off the kids at the indoor play area first, where they have fun playing around in the ball crawl, coloring papers, watching cartoons or cooking a pretend meal in the play kitchen. If we have a little time, we’ll browse through the store to see what’s new before working on our shopping list. This weekend we happened to find something new in the wall decor department. 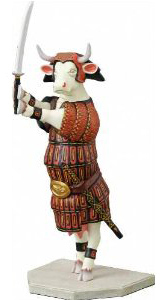 Won’t you look at this stylized cow frame and tell me what you think? It’s only $9.99, quite a steal for a frame this large. 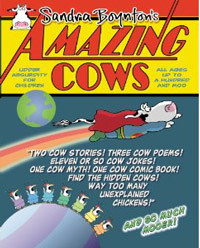 Oh, look, they used a green background that almost matches the one I have on my revamped Every Day I See A Cow blog. How about that? I’m so trendy (the IKEA way)! Next Post I’m going to build my own cow! 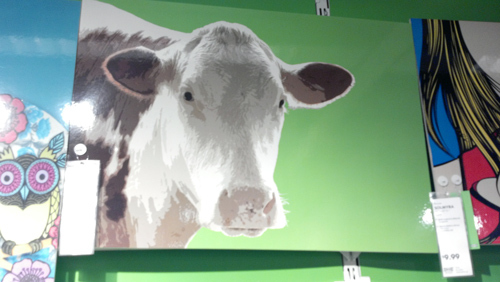 Did you see the cows I found for you in Milton Keynes? Lovely cows, thanks for sharing! That is quite an interesting looking cow, thanks for sharing!